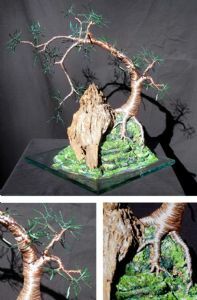 The inspiration for creating my sculpture grew from a lifetime love of trees. I am in awe of the stately presence and silent majesty they posses. I find the structure of trees to be one of the perfections in nature. With their roots embracing the earth; in winter they show their bones, in spring gentle buds, in summer a canopy of green and in fall a magical kaleidoscope of colors. Beauty, pure beauty.